'I almost lost my father just over 10 years ago, it was extremely important to me to have father-daughter photos captured on our wedding day. For months I had planned to surprise him with our father-daughter song, ‘Put Down the Duckie’ from Sesame Street which we used to sing to each other when I was little. 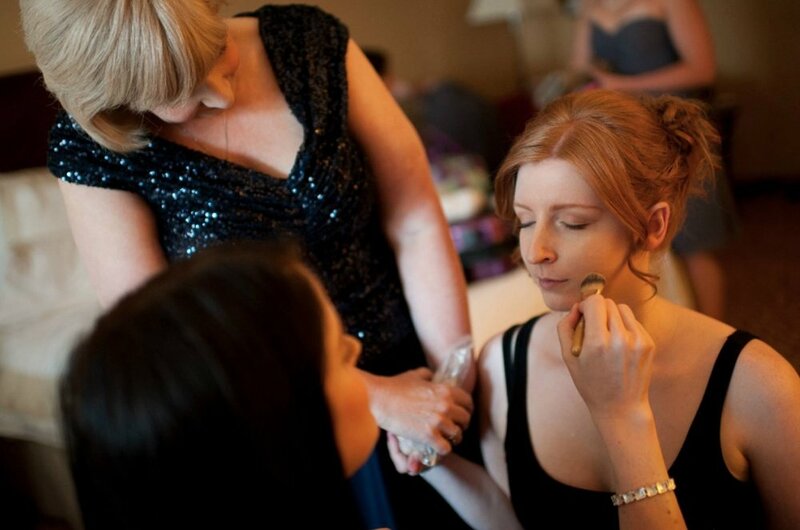 "One of my favourite pictures of me and my mama... Getting my makeup done the morning of my wedding, I started to feel that overwhelming mix of emotions that many brides do - nervous, excited, and so full of joy and love. I remember reaching my hand out, and calling, "Mama?" And like so many times before in my life, she reached back and said, "I'm here." I love this picture because it captures perfectly how present, aware, and loving my mom always is." 'It was an absolutely perfect day, which is just what Scott captured. Though I was expecting at least SOME tears of happiness, my eyes were dry the day of. It wasn’t until our photo viewing with Scott that I welled up–as a result of this picture. Scott so perfectly captured my dad in this photograph. Instantly upon seeing his image, I could see what my dad wasn’t able to put into words about how he was feeling that day. I didn’t notice Scott taking this photo, so when I saw it for the first time I gasped. I am so thankful for this image because I had such a strong sense of my father being with us that day and this picture captures that feeling in a very natural way. When I first look at this picture it brought tears to my eyes. I have always been “daddy’s little girl” and was surprised that my dad didn’t shed a tear on the day (or so I thought). Thanks to Scott a moment that I would have missed was captured. and that I truly was and still am “daddy’s little girl”. "My family moved to Canada when my brother and I were young children. From day one, my grandmother was by our side. She helped raise and take care of us while our parents worked. She had always been such a huge part of my life, so it was very important to have her be a part of our big day. On our wedding day, we promptly made our way to the nursing home right after the ceremony. As we walked towards her and told her that we just got married, she embraced both Mike and I, giving each of us a hug and smiled the biggest, warmest most blessed smile. She was so happy for us. Scott captured that exact moment – a moment that is forever etched in our hearts. Two months after our wedding & just two months shy of her 101st birthday, my grandmother passed away. We are so grateful to have those memories of her from our big day. That moment and smile – captured in time – will forever be with us, and we have Scott to thank for that." 'My grand-papa and I always had a strong bond. I spent many summers when I was young in Chicoutimi with him and my grand-maman. It meant so much to me that he made the trip for our wedding in October, especially knowing he didn’t like to leave the comfort of his home in recent years. 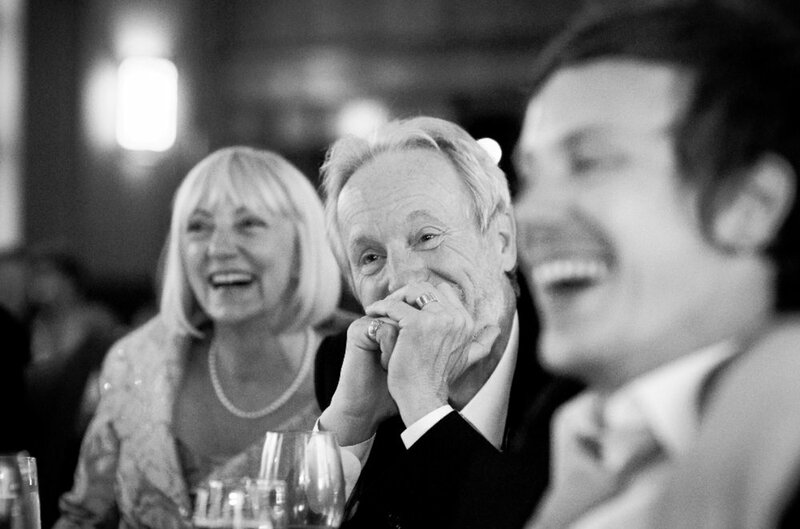 “We have a very close relationship with my parents and are so grateful that Scott captured this natural and relaxed image of them at our reception. It is a beautiful picture that we will treasure for many years to come. They celebrated their 30th anniversary a month after our wedding and it made the perfect anniversary gift."